Emanuel Gottlieb Leutze (May 24, 1816 – July 18, 1868) was a German American history painter best known for his painting Washington Crossing the Delaware. He is associated with the Düsseldorf school of painting. 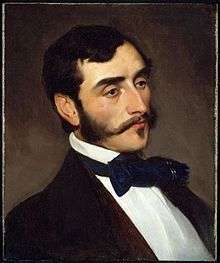 Leutze was born in Schwäbisch Gmünd, Württemberg, Germany, and was brought to the United States as a child. His parents settled first in Fredericksburg, Virginia, and then at Philadelphia. His early education was good, though not especially in the direction of art. The first development of his artistic talent occurred while he was attending the sickbed of his father, when he attempted drawing to occupy the long hours of waiting. His father died in 1831. At 14, he was painting portraits for $5 apiece. Through such work, he supported himself after the death of his father. In 1834, he received his first instruction in art in classes of John Rubens Smith, a portrait painter in Philadelphia. He soon became skilled, and promoted a plan for publishing, in Washington, portraits of eminent American statesmen; however, he met with but slight encouragement. In 1840, one of his paintings attracted attention and procured him several orders, which enabled him to go to the Kunstakademie Düsseldorf. In due to his antiacademic attitude, he studied only one year at the academy (in the class of Director Schadow). Mainly Leutze was affected by the painter Lessing. In 1842 he went to Munich, studying the works of Cornelius and Kaulbach, and, while there, finished his Columbus before the Queen. The following year he visited Venice and Rome, making studies from Titian and Michelangelo. 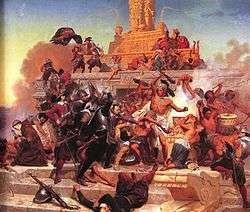 His first work, Columbus before the Council of Salamanca was purchased by the Düsseldorf Art Union. 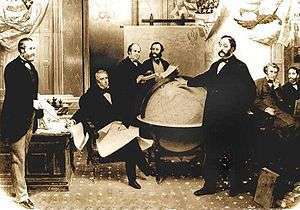 A companion picture, Columbus in Chains, procured him the gold medal of the Brussels Art Exhibition, and was subsequently purchased by the Art Union in New York; it was the basis of the 1893 $2 Columbian Issue stamp. In 1845, after a tour in Italy, he returned to Düsseldorf, marrying Juliane Lottner and making his home there for 14 years. During his years in Düsseldorf, he was a resource for visiting Americans: he found them places to live and work, provided introductions, and emotional and even financial support. For many years, he was the president of the Düsseldorf Artists' Association; in 1848, he was an early promoter of the “Malkasten” art association; and in 1857, he led the call for a gathering of artists which led to the founding of the Allgemeine deutsche Kunstgenossenschaft. A strong supporter of Europe's Revolutions of 1848, Leutze decided to paint an image that would encourage Europe's liberal reformers with the example of the American Revolution. Using American tourists and art students as models and assistants, Leutze finished Washington Crossing the Delaware in 1850. It is owned by the Metropolitan Museum of Art in New York. 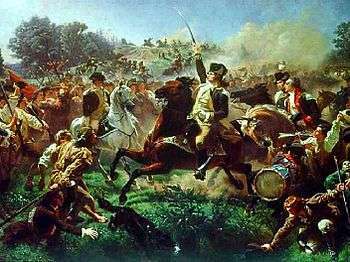 In 1854, Leutze finished his depiction of the Battle of Monmouth, "Washington rallying the troops at Monmouth," commissioned by an important Leutze patron, banker David Leavitt of New York City and Great Barrington, Massachusetts. New York City and Washington, D.C. 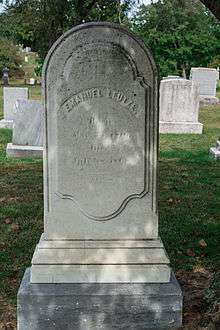 Grave of Emanuel Leutze at Glenwood Cemetery. In 1859, Leutze returned to the United States and opened a studio in New York City. He divided his time between New York City and Washington, D.C. In 1859, he painted a portrait of Chief Justice Roger Brooke Taney which hangs in the Harvard Law School. In a 1992 opinion, Justice Antonin Scalia described the portrait of Taney, made two years after Taney's infamous decision in Dred Scott v. Sandford, as showing Taney "in black, sitting in a shadowed red armchair, left hand resting upon a pad of paper in his lap, right hand hanging limply, almost lifelessly, beside the inner arm of the chair. He sits facing the viewer and staring straight out. There seems to be on his face, and in his deep-set eyes, an expression of profound sadness and disillusionment." Leutze also executed other portraits, including one of fellow painter William Morris Hunt. 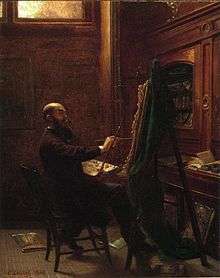 That portrait was owned by Hunt's brother Leavitt Hunt, a New York attorney and sometime Vermont resident, and was shown at an exhibition devoted to William Morris Hunt's work at the Museum of Fine Arts, Boston in 1878. In 1860 Leutze was commissioned by the U.S. Congress to decorate a stairway in the Capitol Building in Washington, DC, for which he painted a large composition, Westward the Course of Empire Takes Its Way, which is also commonly known as Westward Ho!. Late in life, he became a member of the National Academy of Design. He was also a member of the Union League Club of New York, which has a number of his paintings. He died in Washington, D.C., in his 52nd year, of heatstroke. He was interred at Glenwood Cemetery. At the time of his death, a painting, The Emancipation of the Slaves, was in preparation. Leutze's portraits are known less for their artistic quality than for their patriotic emotionalism. 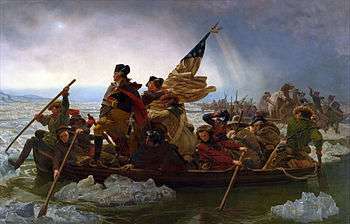 Washington Crossing the Delaware firmly ranks among the American national iconography, and is thus often caricatured. ↑ Marter, Joan M. (2011). The Grove Encyclopedia of American Art. Oxford University Press. p. 144. ISBN 978-0-19-533579-8. 1 2 3 4 Wilson, James Grant; Fiske, John, eds. (1892). "Leutze, Emanuel". Appletons' Cyclopædia of American Biography. New York: D. Appleton. 1 2 3 Witthoft, Brucia; et al. (1982). American Artists in Düsseldorf: 1840–1865. Framingham, Massachusetts: Danforth Museum. pp. 14, 32. 1 2 Groseclose, Barbara (1999). "Leutze, Emanuel Gottlieb". American National Biography. New York: Oxford University Press. ↑ Wolfgang Müller von Königswinter: Düsseldorfer Künstler aus den letzten fünfundzwanzig Jahren. 1854, S. 139. ↑ Downes, William Howe (1933). "Leutze, Emanuel". Dictionary of American Biography. New York: Charles Scribner's Sons. ↑ Heiderstadt, Dorothy (1970). Painters of America. New York: D. McKay Co. p. 88. ↑ Metcalfe, Peter M., ed. (1991). "History, State Designations and Superlatives". Alaska Blue Book (Tenth ed.). Juneau: Alaska Department of Education, Division of State Libraries, Archives and Museums. p. 227. ↑ Harrington, Peter. "Emanuel Leutze's Portrait of General Ambrose Burnside at Antietam". Brown University Library. Retrieved 8 May 2015. Wierich, Jochen. Grand Themes: Emanuel Leutze, "Washington Crossing the Delaware," and American History Painting (Penn State University Press; 2012) 240 pages; Argues that the painting was a touchstone for debates over history painting at a time of intense sectionalism. Hutton, Anne Hawkes (1975). Portrait of Patriotism: Washington Crossing the Delaware. Radnor, Pennsylvania: Chilton Book Company. ISBN 0-8019-6418-0. Wikisource has the text of the 1911 Encyclopædia Britannica article Leutze, Emanuel. 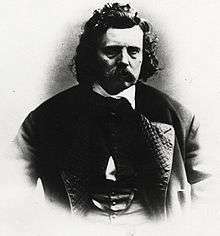 Wikimedia Commons has media related to Emanuel Leutze. Introduction to Washington's Crossing by David Hackett Fischer at the Oxford University Press blog, discusses Leutze's most famous painting. "Leutze, Emanuel". New International Encyclopedia. 1905. "Leutze, Emanuel". Collier's New Encyclopedia. 1921.